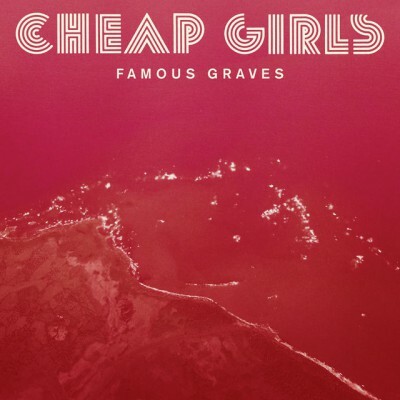 As with any Cheap Girls’ record, the main fault of “Famous Graves” is also it’s biggest strength. The band has never, ever left it’s comfort zone, and have left their music in this frustrating void where the listener knows what to expect and is delighted with another similar record, until it inevitably becomes tedious by the halfway point. “Famous Graves” is no different. It starts strong, but it has a middle that sags from too many similar sounding songs. Part of Cheap Girls’ original act was not to do anything revolutionary, merely to add their own spin onto fuzzy indie/pop-punk (think a more emotional version of Weezer’s Blue album). By sticking so closely to the formula, it reinforces their aim to make consistent and appealing music. But that works a little too well in their favor. “Slow Nod” opens the album, a typically high-volume, medium-speed song with plenty of fuzz and tough to interpret vocals. It’s the band’s staple sound, and songs like “Slow Nod” prove they can still do it well, and with plenty of energy. The second track, “Short Cut Days,” has a catchy vocal rhythm and excels on a sound that’s intentionally condensed in the studio, with a garage feel – but also sounds like it could tear the walls down live. Cheap Girls, at their best, manage to make both sounds simultaneously. The album’s third song and lead single, “Knock Me Down,” is a more personal song about overwhelming pain felt after surgery, and combines strong vocals, strong lyrics and energetic music, the album’s best package. After that, though, there’s a long string of songs that do nothing to differentiate themselves from each other. While they’re inherently enjoyable, they all follow the same formula. They’re almost all in the three-to-four minute range and they feel like time that’s being killed off until the album’s strong finale. Having weak and formulaic tracks is almost unavoidable, but five of the eleven songs feel like underdeveloped cuts they’re burning off. A bulk of the album, roughly half of it, falls victim to serious repetition. The album does have a strong finale, though. “Thought Senseless” stretches (barely) over four minutes, and is a little more developed than a typical Cheap Girls song. “Turns” is a pseudo-ballad, one that has many of the characteristics of one, except that it isn’t a soft song, which makes for an interesting listen. And bonus track “7-8 Years” is more vocally forceful than any of the album’s other songs. The mix of acoustic and electric allow the vocals to come through more clearly, and it ends up adding an element to it. At their core, Cheap Girls are an enjoyable band. They’re both incredibly simple and subtly complex. They’ve always blended fuzz and pop, in a 90’s throwback. Their sound translates well live, and their albums can accompany any real mood or season. “Famous Graves” just sounds too repetitive, and it could easily be shuffled in and lost amongst their past albums. Cheap Girls aren’t going to win any new fans over with this album, they’re just going to have a few more great songs for fans to eat up, and some more to pass on by. -If you like this, try: Lemuria’s semi-classic 2008 album, “Get Better.” They have a constant sound much like Cheap Girls (and the two have recorded together).